Demonstrations held in more than 10 cities across Israel in bid to lower spiraling costs of living; joint Jewish-Arab protest held for first time since demonstrations began 16 days ago. In Ashdod, protesters marched from City Park. 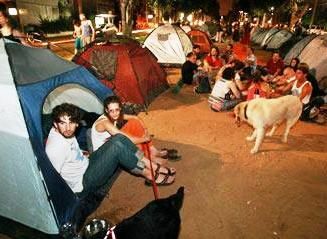 Around 150 people gathered at Ashdod’s tent city on their way to the march. Students from Beit Barl marched from the tent city at Kfar Sava to central Ra’anana junction. For the first time since the beginning of the protests 16 days ago, a protest involving both Jews and Arabs took place in central Nazareth. In Kiryat Shmona 1,000 protesters marched in the city’s main road, towards the southern exit of the city. Many prominent Israeli musicians performed at the rallies, including Hemi Rodner, Dan Toren, Yehuda Poliker, Barry Sakharov Yishai Levi, Aviv Geffen, and others. Israelis hold up banners as they march in Tel Aviv on July 30, 2011.